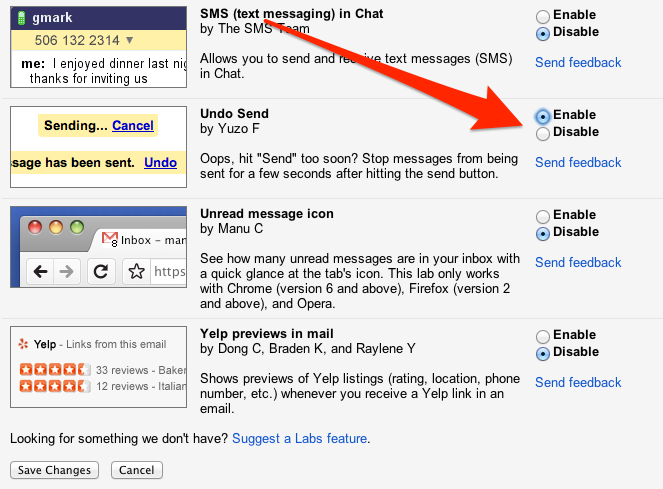 Gmail's Undo Send feature, is a nice feature, but its buried in the Gmail Labs settings that you first have to enable. It gives you a 30 second window to cancel sending an outgoing email. So first, you have to enable it. 1. Click the gear icon in the top-right corner of your Gmail window and select Settings from the dropdown menu. 2. Select Labs from the row of tabs. 3. Scroll all the way to the bottom where you see Undo Send and click Enable, or you can search for it. 4. Hit Save Changes at the bottom. Now when you send an email, the yellow dialogue that displays "Your message has been sent" will also give you the option to Undo. Click it, and the email will reopen, un-sent, in the composition window. It defaults so that you have 10 seconds to click before the Undo button disappears, but you can adjust that window of opportunity. Go to Settings > General > Undo Send, and select a cancellation period up to 30 seconds.